You are able to park horse floats just down from The Redwoods Gift Shop & Visitor Centre on a grassed area under the shade of some roadside Redwoods. Here you can clear horse dung from your float, or dispose of dung collected during your ride into the composting bins. This really does help to keep the forest clean. 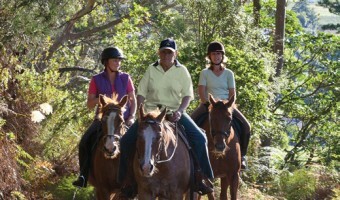 For your own and your horse’s safety and the safety of other users please keep to the marked trails and roads. If in doubt don’t venture onto a trail. Horse riding has dangers. Proceed at your own risk and ride within your ability. Ride at a safe pace – galloping and racing of horses is prohibited. Please wear approved helmet and riding boots and other suitable protective riding attire. Follow the direction of coloured horse symbols and accompanying arrows. Keep to the dedicated horse trails and roads. Forestry roads are multi-use – beware of vehicles, walkers and bikers. Be prepared with maps, clothing, food and water appropriate for the length of trail you are undertaking. Always plan for the unexpected. Where possible, stop and remove horse manure off roads and tracks and deposit in compost bins when you return.